Clod is a magnet for bullies because he is different than his classmates. He is bigger, clumsy and ugly along with having no magic. In a world where magic makes everything possible, Clod has no friends and has trouble getting along with other people. Clod lives with his mother, Eidy in a small cottage where they barely have enough to survive. One day after a visit from his teacher, Learned Yugen about an incident at school, Clod is more discouraged than ever. He takes to building a friend out of clay that his mother brings for him every day. 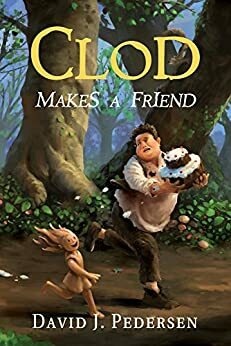 One day, the clay girl, Ada comes to life and becomes friends with Clod but her confidence and courage get them both in trouble. Is Ada the friend Clod desperately needs? The novel was a quick and fun read especially with the dynamics between Ada and Clod. There were portions of the book where I thought the sassy Ada would become another bully for Clod but I was happy when it turns out that they both needed each other. While I did enjoy the book, I wish the author went into a bit more details especially about the dark war and Clod's family. Overall, it was a fun treat to read and I look forward to reading other books by the author. David J. Pedersen is a native of Racine, WI who resides in his home town Kansas City, MO. He received a Bachelor of Arts degree in Philosophy from the University of Wisconsin – Madison. He has worked in sales, management, retail, video and film production, and IT. David has run 2 marathons, climbed several 14,000 foot mountains and marched in Thee University of Wisconsin Marching Band and written 4 fantasy novels. He is a geek and a fanboy that enjoys carousing, picking on his wife and kids, playing video games, and slowly muddling through his next novel. Thanks for the review, and for featuring Clod Makes A Friend! Thank you for providing me the opportunity to read the book!